MLK weekend is here and that means the first tournament of the season is, too. Florida Winter Classic: where the weather is usually pretty warm, but not always,1 and we get our first little taste of the season and the stories that will define it. The tournament is back in Gainesville for 2019 after several years in the Orlando area and features a couple of potential top five teams, and a few other Nationals hopefuls. There will certainly be enough to keep an eye on to get fully excited for the start of the season. So here’s your primer for the 2019 college season kickoff tournament. If #1 Dartmouth Princess Layout really wants to win FWC, they probably will. The top end of their roster, despite the departure of Julianna Werffeli, still feels unfair. No one at FWC will be able to go blow for blow with Jack Verzuh, Caitlyn Lee, and Claire Trop if those three play a lot of points. But Dartmouth may not be all focused on winning the tournament this weekend. Beyond that trio, Princess Layout have quite a bit of turnover from last season’s title-winning team. In fact, they’re the only three returners who registered two or more points (goals + assists) at Nationals last year. That doesn’t exactly mean it’s time to start celebrating the end of Dartmouth’s reign over the division. They add three star freshmen in Caroline Tornquist, Grace Alston, and Jennifer Qian, giving Dartmouth the sixth-best recruiting class in the country, per Ultiworld’s Scott Dunham. But the point is that Dartmouth is probably going to exhibit a few growing pains early in the season as they build their new players and depth into a formidable, championship caliber supporting cast for the three titans currently leading the team. That wouldn’t be new for Dartmouth either. When they last attended this tournament in 2017, they had a couple of squeakers over Kansas and Florida that raised some eyebrows. They still wound up winning the tournament, but they were nowhere near the level they reached several months later when they would cruise to their first of back to back national championships. We know what Dartmouth is. They’re title favorites and the top team in the division until proven otherwise. But they probably won’t look anywhere near their best this weekend, as they play for the long term maximization of their 2019 roster. And there’s a high probability that they’ll win the tournament anyway, which just goes to show the state of their program right now. #5 Ohio State Fever will fancy their chances of winning FWC, too, especially if Dartmouth takes a process-oriented approach to the weekend. Ohio State’s depth is already largely in place, as they have one of the higher roster return rates in the country. A couple of high profile players lead the roster in Sadie Jezierski and U24 national teamer Cara Sieber, but Ohio State has some other unsung stars, too. Emily Barrett is a goal-scoring force, who could be one of the tougher matchups for Verzuh this season. Annelise Peters emerged as a strong backfield presence for Fever last season. Mix in some impressive depth pieces like Whitney Schott and Stephany Stumphauzer, and you can see why Ohio State is ranked where they are in the preseason rankings. Fever finished second at FWC to West Chester last season, and it would surprising to see them come short of the final this year. They heartbreakingly missed out on the bracket at Nationals last year due to a goal difference tie breaker, but they’re dark horse semifinals contenders with the roster they bring back. Taking the FWC crown would go a long way to starting their revenge tour. Georgia Athena, Florida FUEL, and Georgia Tech Wreck make up the tournaments second tier of semifinals hopefuls. They also represent the three teams who project to be vying for a Southeast regional title come May. The preseason favorite is Georgia, who nearly upset eventual Southeast winners Florida in semis at Regionals last season. They bring a lot of their exciting roster back, losing just two players from last year’s team, and they add one of the more exciting freshmen in the region in recent years, Marie Perivier. Perivier brings the team’s Atlanta Ozone contingent up to three, with senior Alex Fairley and sophomore Josie Veal also playing with the perennial Club Nationals attendees over the summer. Georgia has one of the most talented roster the region has seen in the last few years and are the regional favorites despite not having a single player on their roster who has ever made College Nationals. They’ll want to announce themselves as true national players this weekend. Florida, back-to-back winners of the region, saw major roster upheaval, but should still be contenders for the regional crown in 2019. Coaches Dustin and Kate Travaglini are two of the best in the biz, and will surely be using this weekend more for roster building than seeking any major wins. Gabby Krajniak is a first team all region caliber player, but otherwise new players will have to step up into bigger roles if Florida is to get the regional threepeat. Senior Charlotte Talham, and seniors Pilar Alvarez and Sydney Weiner are good candidates to help form the new top end of the roster. this weekend should give us an idea of how the roster will shape up as the season progresses. The most interesting development to keep an eye on from a FUEL perspective, though, is the playing time for Janina Freystaetter. She was on the roster last year, bud didn’t play at all. The word is she may try to play a bit this season. If she is able to play and is anywhere near the level she was at a few years ago with UCF, her presence would be a huge swing back in the favor of the two-time defending regional champs. Wreck has been on the cusp of the Nationals picture the last couple of seasons, but things haven’t quite broken their way. Ousted in regional semifinals in each of the last two seasons, they look like they’ll be contenders within the region once again. U24 tryout attendees Almaze Lema and Jenny Choi both return in 2019, and Ollie Peterson and Alli Wong help those two form a strong core. Wreck does have a new-look coaching staff, however. Lizzie Jones, who had been an assistant with the team, is now at the helm, Lily Ponitz (who was coaching the B team), and newcomer Jin-Mi Matsunaga make up the new crew, and gone are long time program builders Maddy Frey and Anna McKee. Tech has had one of the more tight-knit team cultures in the region over the last few years, so that regime change should be an interesting one to track as the program looks to get over the hump and make Nationals for the first time in the modern era. UNC Wilmington, Florida State, and Central Florida round out the top eight seeds of the tournament, but Emory has a claim to be considered in the same tier. Wilmington brings a typically small roster, but Hannah Samuelson and Shannon Hardy provide experience at the top of the roster. Florida State is coming off their worst regional finish in years, but there’s experienced talent there, too, with the likes of Lindsi Allman, Natalie Dix, and Courtney Read. Central Florida is a question mark, with no one left from the team that made Nationals in 2016. Emory feels like the more intriguing team, at least in the power rankings of the Southeast. Leah Gilbert-Odom and Anna Glass are two potentials for the 2019 all region team. 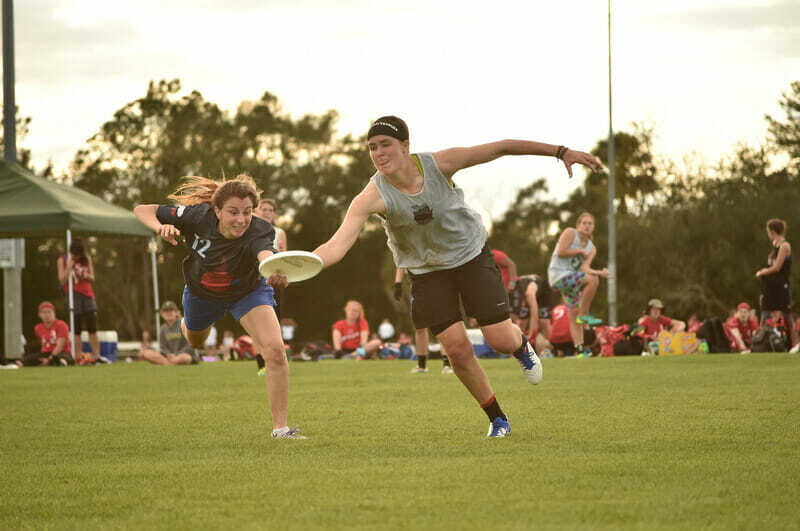 Comments on "Florida Winter Classic 2019: Tournament Preview (Women’s)"